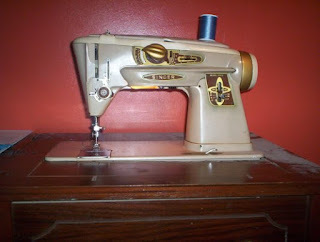 I bought this sewing machine today from Craiglist for $40.00. It needs a cleaning and servicing which I plan to do myself following a posting on You Tube. Congrsts on your new baby. One day I'm going to find one of these. Good job. Enjoy!! I love the look of that machine! It looks like something out of Flash Gordon! I love the look of your new machine, it's beautiful! Thank you for your kind comments. I am going to clean it up myself following one of the many videos posted on You-Tube. My ultimate goal is to set up a not for profit business to teach kids and young adults how to sew and to reward one of two of my students with one of the machines I am collecting.